Unless you've been living under a rock, you've either heard or experienced firsthand how well Apple's search ads campaigns have been performing. You've also probably heard of or experienced that one of the biggest gripes so far is the lack of available ad impressions. Apple has yet to devise a good way to ensure your campaign doesn't run out of budget, but keeping your campaign budget topped off is one of the easiest ways to ensure your campaigns continue scaling. Additionally, if Apple search ads are anything like Facebook Ads (how budgets affect ad serving is yet to be known), the campaigns with the largest total and daily budgets will see their impressions filled first. Your max CPT bid is one of the main levers for determining whether your ad will win an impression. If you are willing to use a CPT bid of $5, but your competitor is willing to a CPT bid of $10, then your competitor will take that impression and you will not (assuming TTR, relevance, etc. are all equal). So, raising your max CPT bid is another easy troubleshooting tactic. 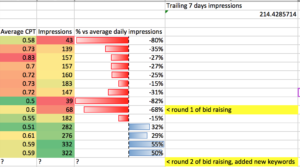 Try raising your max CPT bid to 2x, 3x, 4x, 5x vs your baseline; but make sure to do it gradually over a period of days in-between bid changes to ensure that your bids have a chance to propagate through the ad serving engine, and performance data has had a chance to return to your UI. Plus, you don't want to run the risk of suddenly starting to serve ads at a higher max CPT bid level and accidentally blow through budget. The maximum you are ever willing to pay per tap. A main determinant of whether or not you will serve ads for search impressions, when compared to your competitors' bids. Exact match is the most restrictive type, followed by broad, followed by search match, which is the least restrictive. So if you're bidding on an exact match type, it will naturally garner many fewer impressions vs broad, vs a search match target. We recommend, however separating your search match targets into a separate ad group/campaign vs your keyword targets. Optimizing your app listing (screenshots, icon, reviews, first several lines of your description). Optimizing for high performing target dimensions (e.g. age, location, time of day). Adding search terms that have high impressions and low TTR as negative keywords (for search match or broad match keywords). It's possible you may be using a keyword that has a low number of searches per month, which is a reason you're not able to scale for traffic. Many times, the higher the ROI of a keyword, the lower the number impressions available (the concept of head terms vs long-tail terms), so you may need to go back to the drawing board and find keywords that you draw value from, yet which have a decent search popularity score. Apple's relevance score, which determines whether your ad is eligible to participate in a search auction, analyzes your app's metadata (i.e. title, keywords, etc.) to determine whether your app is relevant enough to show an ad for the keyword you're bidding on. It's in Apple's best interests to show relevant apps for keyword searches, hence it has a system to ensure users aren't getting poor results when they do a search in the app store. Just because you're matching to a search term using search match or a broad match type keyword, does not mean that this is sufficient for earning traffic on that search. By adding a search term as a keyword, you're informing Apple and its ad serving engine that you want traffic specifically from or related to that keyword, which can improve your chances of showing an impression the next time you're up to bat for that search. Adding negative keywords is important for keeping ROI high, as well as improving your TTR and thus your chance of serving ads. That said, without proper management, they can block good traffic. Negative keywords (like regular keywords) will default to broad match type if not specified as exact, so if your keyword is car games and you add car as a broad match negative, you're going to block your keyword from showing ads. By using a CPA target (that is not extremely high), you will reduce your ability to show ads. This is because a CPA optimizer will be more picky with the impressions that it shows your ad for, in pursuit of achieving your target CPA. If out of five impressions, the algorithm thinks that just one will earn your target CPA, then you'll only serve an ad for that one impression, vs possibly all of them if you're just using only a max CPT bid (if your max CPT bid makes you eligible to win those auctions, that is). It's tough when advertising and seeing data in near real-time not to have a knee-jerk reaction to a poor patch of performance. Yet, the nature of advertising is that there will be sporadic periods of good and bad performance, which have little to do with your product or your management of the advertising campaign; sometimes, people just don't feel like installing or purchasing. For your keywords that have proven to perform well and have hit a rough day, watch them, but don't immediately pull back. You can investigate to determine whether the competition or your product has changed in some more permanent way, but give your keywords some slack, look at week-long trends and compare the same units of context, like Monday to Monday, not Monday to Saturday. If the trend of under-performance continues for several days straight, then it may be time to take action. The first is simple: do a search of your keyword to determine whether any other advertisers are serving ads or not. If they are but you aren't getting impressions, then you can assume that your bid, relevance or TTR are not sufficient to serve an ad. As of yet, search ad campaigns are missing a very crucial part of campaign management, which is called impression share. This data point is what tells you how many impressions you could have received over some time period. By comparing the number of impressions that you could have received with the number you actually did, you can determine whether that keyword actually has more value to extract through raising your bid or optimizing relevance or TTR, or not. By measuring trends in the number of daily impressions, you can determine whether your actions (such as increasing bids, adding negative keywords or adding new keywords) are moving the needle in the right direction. Reporting on your ad groups/campaigns also helps you see how your average CPT changes, which is one metric that you always want to keep an eye on when scaling, given that seeking more, quality volume can often come with a higher price tag per click or tap.